HiRISE is a great camera, but it, unfortunately, does not show you the martian surface in the colors that you would see with your own naked eyes. If you would find yourself on Mars (lucky you!) things would look different. Sorry for this, but actually, no camera, even here on Earth, does show you exactly the same as what you see. You might be familiar with the situation when two different cameras take two images in the same setting and one image turns out reddish while the other one – totally greenish. Why is that? The answer lies in the way cameras, or more strictly saying camera detectors, create color images. Let’s start from creating a black and white image. This is fairly simple: each pixel of our CCD is sensitive to light, i.e. the more light it gets the higher digital number it records. When you arrange many of pixels next to each other and place them all in front of a contrast scene, dark areas will get small numbers, bright areas – large numbers, and you have created a digital image of the scene. This image contains only intensity information and no color information. In real life most standard CCD cameras are sensitive in the wide visible range with enhancement in the red side of the spectrum. By the way, our eyes have something like a CCD: the retina, an array of cells sensitive to light. For example, an array of rod cells would most closely resemble a black and white CCD. Rods are very sensitive and allow us to see in rather dim light, but only in shades of gray. Additionally, we have a set of cone cells of three different types. These are not as sensitive as rod cells and highly specialized: each type is sensitive to different parts of the visual spectra, Red, Green and Blue. Combination of the signals from these gives us color vision. To create a color image HiRISE combines images from three CCDs each of which has a color filter placed in front of it. For a realistic color image we would ideally want to combine Red, Green and Blue images. Or any other set of colors that, when mixed, can reproduce the full color spectrum available to the human eye. In reality HiRISE has Red, Infra-Red and Greenish-Blue filters. The scientific team of the camera selected this set of colors to be able to distinguish different minerals in the top surface of Mars from each other but also for some technical reasons. 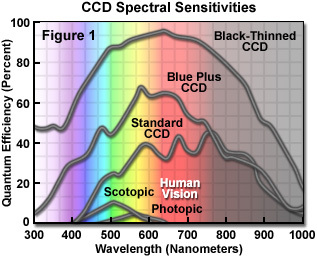 It is hard (and expensive) to make a CCD sensitive in the blue side of the spectrum. It is also hard to produce filters that let only very narrow spectral band to pass through. This is why the HiRISE Blue filter is slightly greenish. If one simply merges the available HiRISE filters together, the result is similar to the left side of the image below. Here the Red channel carries the IR image from HiRISE, the Green channel the Red HiRISE image, and the Blue channel the Green-Blue HiRISE image. And they all are scaled in such a way, that their maximum and minimums are the same (what we call “normalized”). One can see in a small diagram in the top left corner the histograms for the three channels, each drawn in the color they represent. And where they overlap, the color tells you the resulting color of the mix. Because green and blue channels are so similar (HiRISE IR and Red filters are overlapping), our image is mostly yellow-green. On the right side you see more realistic RGB image created by the HiRISE team to give us better color impression. Smart computer code written by HiRISE engineers artificially created a synthetic green channel from the information available in the three real HiRISE channels. It also slightly increased the “weight” of blue and green channels while putting the three new channels together. In this image it helps to highlight the bluish fans. In other cases it might be useful to increase only blue (or maybe red?) to highlight other features, like minerals in the ground. We can see the effect of these changes in the histogram in the top right corner – red channel stayed mostly same, while blue and green are now narrow and tall, actually off the charts on this plot. The conclusion? The color information in the images you see in this project is real. The way this information is put together to create a color image varies from image to image. This makes it harder to compare colors between different images, but easier to see features inside each image. There is always a tradeoff, always. For now, let’s admire our pretty color images one at a time. With a pinch of colourful salt. Great post but I’ll need to read it a few times for it to stick… thanks.